Cormorants and seagulls nest on Bodkin Island, Md., in the Chesapeake Bay on June 18, 2010. Cormorants live along the coast and on islands, lakes and rivers. Found year-round throughout the Chesapeake Bay. The double-crested cormorant is a large, black water bird with a long, hooked bill. It lives year-round on the Chesapeake Bay’s shallow and open waters. The double-crested cormorant grows to 32 inches in length with a wingspan of 52 inches. It has a large, black body, a long neck and tail, and an orange chin patch that is squared and has no feathers. 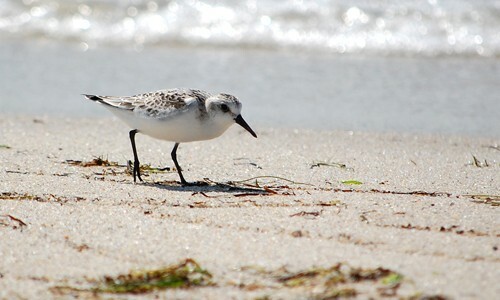 Its long bill has a small hook on the end; it holds its bill tilted upward when swimming. They have striking teal-colored eyes and a mouth that is bright blue on the inside. Young cormorants have a pale throat and chest with a brownish back and wings. They are often seen perched on rocks, piers and pilings with its wings spread in the air; they do this to dry their feathers and regulate body temperature. Cormorants eat mostly small fish, but will also feed on aquatic invertebrates such as insects, crustaceans and amphibians; an adult will eat an average of one pound of fish per day. They dive underwater to capture prey in their long, hooked bills. 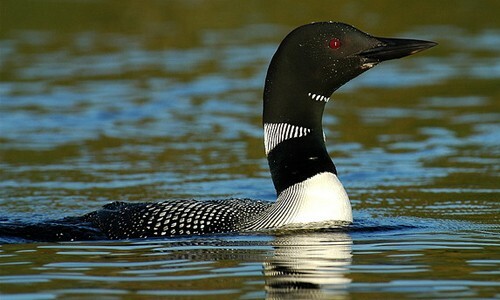 Gulls, crows, blue jays, raccoons, red foxes and coyotes prey on cormorant eggs and chicks. The cormorant has a noticeable crook in its neck while flying. 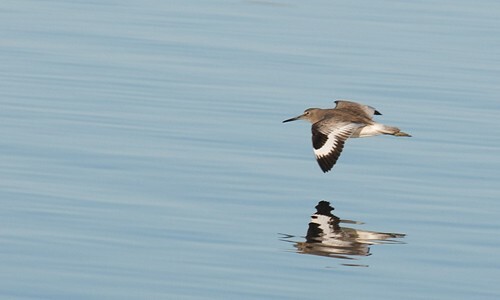 It flies in lines or V-shaped formations, similar to geese, and can often be seen flying low over the water. Almost entirely silent, cormorants will sometimes make deep, pig-like grunts in their nesting colonies. Breeding occurs mostly in the Great Lakes region and the Midwest into Canada. They will nest in colonies with other cormorants. Nests are bulky and made up of sticks, plastic debris, rope and other materials. Females lay between 1 and 7 eggs, typically 3 to 4 eggs. Both parents incubate the eggs for 25 to 33 days. Young may leave the nest around 3 to 4 weeks old, but will return to the nest to feed. At 5 to 6 weeks they are able to fly and are mostly independent at 9 to 10 weeks. Cormorants can live as long as 22 years, but typically live to 6 years old. Cormorants' eyes are adapted to see both above and under the water. Double-crested cormorants can be confused with the common loon. You can distinguish a cormorant by its hooked bill, which it holds tilted upward. The double-crested cormorant is the most abundant and widespread cormorant in North America. An estimated two million double-crested cormorants live in North America.